Concur TripLink customers can now connect their SAP Concur accounts with HRS’s corporate booking portal and mobile apps at an enterprise level using company-level linkage on the HRS App Center Listing. HRS is a global provider of corporate hospitality services. TripLink, according to Concur, extends the benefits of a managed travel program to direct supplier bookings, allows businesses to ensure compliance, fulfill duty of care requirements, maximize corporate discounts and more. 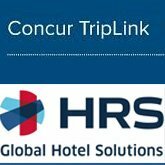 The linkage allows all bookings on HRS mobile apps or the HRS Corporate Booking Portal to sync directly to Concur Travel, the Concur mobile app, and TripIt Pro. Bookings automatically appear in a traveler’s SAP Concur account without a need to email anything, providing immediate visibility into traveler spend and monitoring for policy rules, if applicable. Jason Long, vice president of global solutions for HRS, said that TripLink’s increasing traction with corporate programs dovetails with HRS’s growing client roster.